FIU’s Miami Beach Urban Studios is collaborating with Miami Beach on the city’s centennial. The City of Miami Beach is throwing a year-long birthday bash and FIU is getting in on the party. As part of an expansive partnership with the city that began last year, FIU will host numerous events in conjunction with the 100th anniversary of Miami Beach, a city of just seven square miles that was incorporated on March 26, 1915. Though the celebration runs all year, the major centennial events will be held March 22-26, including a performance by the FIU Symphony and Concert Choir at St. Patrick’s Cathedral on March 25. FIU has had a significant presence on Miami Beach for years – so partnering with the city was a natural fit, said John Stuart, associate dean of cultural and community engagement in the College of Architecture + the Arts (CARTA) and executive director of the Miami Beach Urban Studios (MBUS). 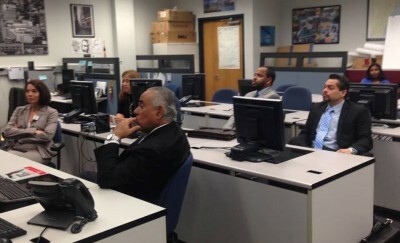 FIU faculty and staff recently met with Miami Beach officials to discuss transportation issues in the city. Beyond the centennial events, projects included in FIU’s partnership with the city range from sea level rise and transportation to dual enrollment and new courses at MBUS. 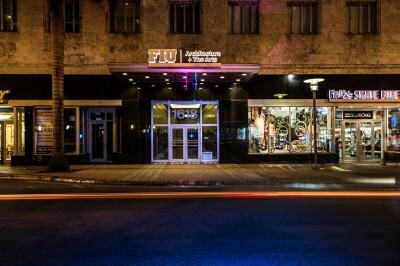 Located in the iconic 420 Lincoln Road building, FIU’s MBUS has worked with city leaders for months to help plan FIU’s collaboration with the centennial. In addition to MBUS, the Wolfsonian-FIU and the Jewish Museum of Florida-FIU will play a part in the festivities. Exhibitions are planned on the city’s Jewish history, the development of the Art Deco district and the work of Russian architect Morris Lapidus, best known for designing the iconic Fountainbleau and Eden Roc hotels, as well as Lincoln Road Mall. After reviewing works in the Bass Museum of Art, CARTA students are creating analytical drawings and models for an exhibit on Lapidus, who developed a modern architectural style synonymous with 1950s resort hotels. The exhibit will be followed by a panel discussion for students and the community in late April. MBUS will also co-host a three-part retrospective titled “Jewish Miami Beach: 100 Years of Histories and Communities’’ in partnership with the Jewish Museum of Florida and the Holocaust Memorial. In addition to the events at MBUS, the Wolfsonian will host three exhibits related to Miami Beach history. Other ideas planned for the centennial include the creation of a Miami Beach history book, a book of poetry about Miami Beach and a large-scale archiving project of historical photographs. Working with Frank Luca, chief librarian at the Wolfsonian, FIU students have begun digitally cataloguing more than 10,000 items from the city’s archives. A website of images is expected to be launched later this year. In addition, the second annual O, Miami Poetry Festival, Poetry in the Park – launched in 2011 by FIU alum P. Scott Cunningham – will take place on April 12 at the New World Center on Miami Beach. Despite the flurry of activity surrounding the centennial, the city’s partnership with FIU goes far beyond the 100th anniversary celebration. City leaders have been meeting with FIU faculty and staff for the past year. FIU’s College of Engineering and Computing, the College of Arts and Sciences, Small Business Development Center and University College have all played a role in the partnership. One of the largest components is collaboration on sea level rise and other coastal issues. A work group of 75 individuals from FIU and the city are focused on topics such as groundwater monitoring, infrastructure, beach erosion and seawall design, as well as urban design and historical preservation. “FIU’s partnership with the City of Miami Beach facilitates civic innovation, applied learning and engaged research,’’ said Nicole Kaufman, interim vice president for the Office of Engagement, which is spearheading the initiative. The centennial, Stuart added, presents a unique opportunity for the community to learn more about a unique piece of the area’s history. “I’m looking forward to seeing how Miami Beach sees itself in the mirror of history that is reflected in the diversity of events, the depth of the challenges, the strength of its convictions, the quality of its historic and newly built fabric and the breath of the its vision for the next 100 years,” he said. For a complete schedule of Miami Beach Centennial events, visit MiamiBeach100.com.